Is it Time to Replace Your Firing Pin Spring? Recently I have noticed a few threads on shooting forums that discuss the advantages of replacing the firing pin springs in your rifles on a regular basis. This is to make sure that the springs are in good operating order and provide proper energy to the primer when the cartridge is fired. Some of the stated advantages included lower velocity extreme spreads, lower standard deviations, and improved accuracy over worn out springs. 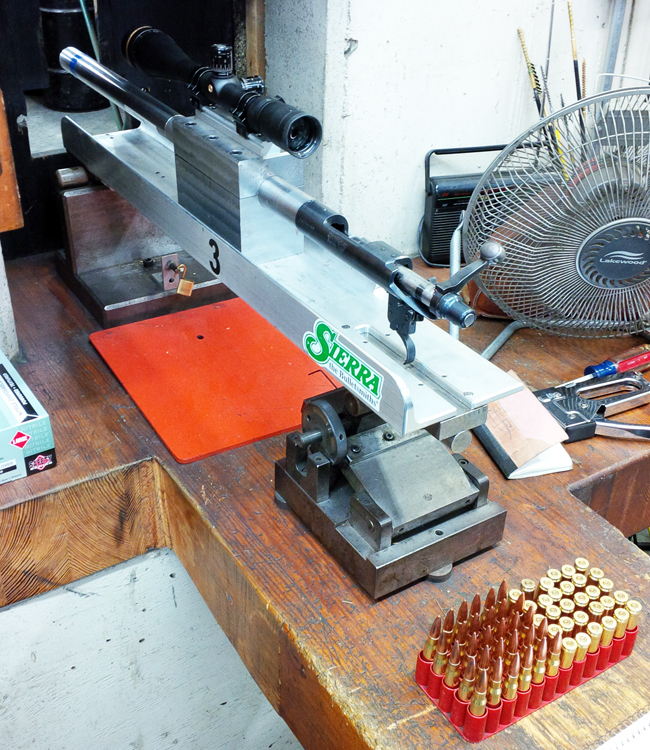 In our range here at Sierra Bullets, we replace springs on a regular basis as preventative maintenance. However, I was curious to see if there would be a visible improvement when replacing a spring that had been in service for a while. I looked over our gunsmithing log and found an action that had close to 40,000 rounds on it without changing the spring. This action always seemed to shoot no matter what type of barrel we installed on it and the current barrel was no different. I figured that if any improvement could be gained by changing the spring, this rifle would show it on target. Since the action is a trued Remington short action Model 700, we always have spare springs on hand so I grabbed one and headed to our range. We installed the action into one of our return to battery rests and set about deciding how to perform the test. Since time was somewhat limited, it was decided to load up sixty rounds of ammunition and shoot six five-round groups using the old spring and six five-round groups at 100 yards using the new spring. We used the old standby #2200 30 cal 168 gr HPBT as the bullet of choice loaded over a charge of 40 grains of 4064 powder. All ammunition was loaded at one time and all bullets were out of the same lot to make things as consistent as possible. After looking at the cleaning log, we decided not to clean the barrel during the test since the rifle had fifty rounds on it since it had been cleaned. The first target showing the results of the old spring is shown here. Average group size was 0.393, 28 extreme spread, and 11 standard deviation over the six groups. The rifle is capable of shooting a little better than this with some tuning however all we were concerned with is if the new spring could improve on the data we collected from the old spring. After shooting the first target, the bolt was removed and the firing pin spring replaced. 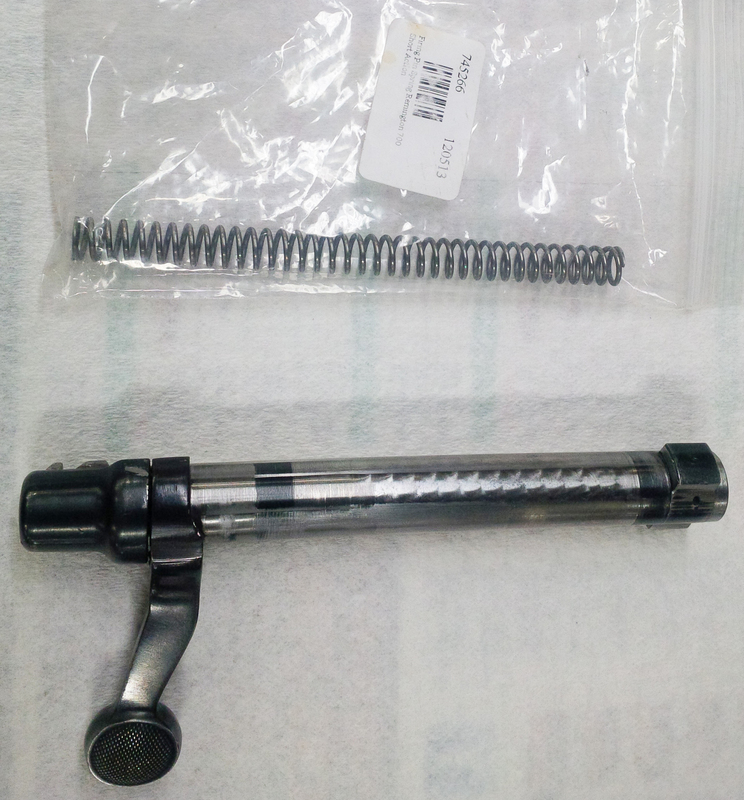 The picture shows the bolt alongside the replacement spring. While there are many different aftermarket springs which claim to be better, we used a factory replacement spring. This picture shows the old spring alongside the new spring. The old spring had compressed about three full coils when compared to the new one. Once we completed the spring swap, we went back to shooting. The next target showing the results of the new spring. Average group size was 0.378, 29 extreme spread, and 11.6 standard deviation over the six groups. Once again the rifle is capable of shooting better but we were looking for any sign of improvement when using the new spring. Comparing the data we see that the group size did improve slightly when using the new spring however the extreme spread and standard deviation were actually slightly worse. 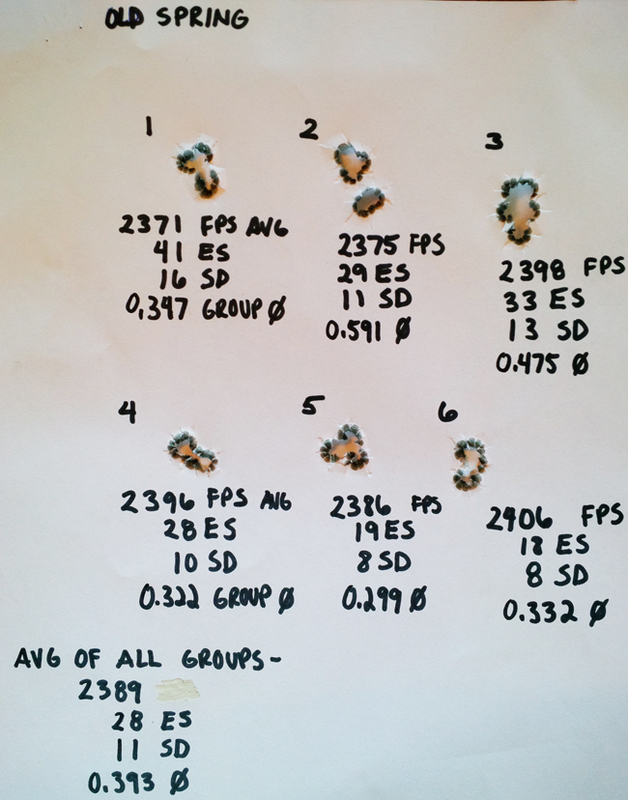 Now I realize that this test is far from complete and it would take hundreds of rounds fired over several days with many different loads to get a statistically meaningful result. However we can see that the new spring did not make a drastic difference in the loads here. All this being said, I still swap the springs in my competitive rifles on a regular basis to make sure there are no problems during a match. 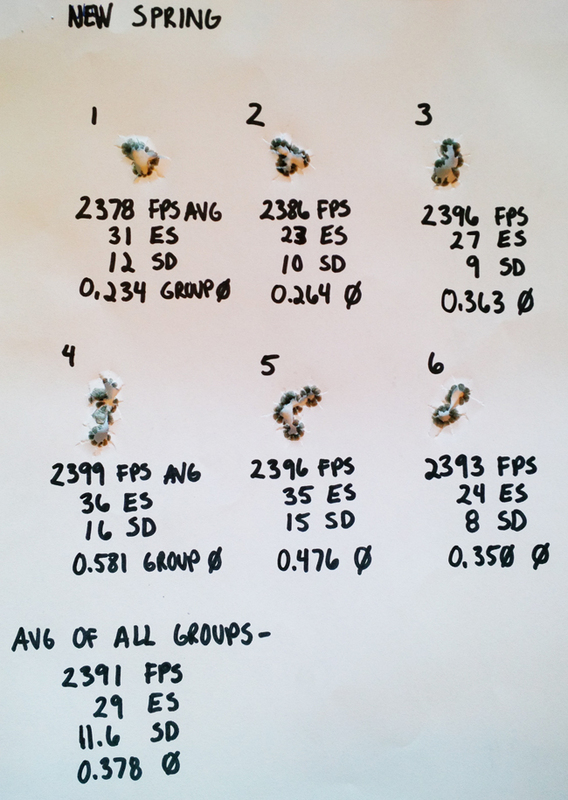 This entry was posted in Competitive Shooting and tagged firing pin spring, firing spring, improved accuracy, lower standard deviations, lower velocity extreme spreads, rifle accuracy, shooting accuracy. Bookmark the permalink. 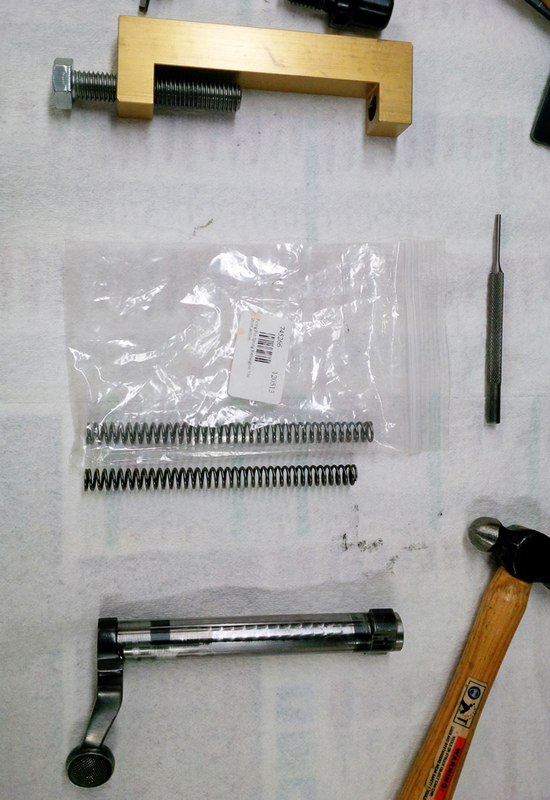 4 Responses to Is it Time to Replace Your Firing Pin Spring? Thank you for doing this. This is something I would have thot would give better accuracy. Interesting test, but as you mention not entirely conclusive. Because a new spring gives one slightly faster lock time, I would not expect any real difference on a quality machine rest, one of the reasons for using them. I would however expect to see more difference when not using a rest, as the rest takes out most of the element of movement between tripping the trigger and ignition. The only movement in a rest should be a bit of vibration, which would last for an extremely short period of time. However, holding the firearm in one’s hands, allows for a longer period of potential movement during the lock time. Although Model 700s have a great firing pin spring to begin with, reducing change of lock time as it ages. It is the difference of lock time from a new spring while hand holding the firearm which is going to show possibly different results which has the greatest interest to me. Another element to consider is this; does the new spring change the trigger pull? It would seem a high tension firing pin spring would ever so slightly change the trigger pressure needed for let off. Something to consider in the overall testing. A machine rest is going to completely mask that portion of the testing. With modern components, especially primers, I would think one would see the results you experienced. The completed test is really going to show more of how sensitive/consistent the primers being used are to slightly different primer stikes, more than anything else. Primers explode, powder burns. If you can initiate the primer explosion it is going to detonate with the same velocity every time, give or take the variation in primer composition – which is probably so small as to be virtually undetectable in a centerfire cartridge. I’m with Firstriverbend … the improvement in lock time is all you’ll get out of a swap between a working spring and a new working spring. (Working – as in hasn’t collapsed so much as to fail to detonate a primer reliably.) Improved lock time will only show up in a test when the rifle is allowed to move between trigger break and primer detonation. But thanks for doing the test and reporting the results – it’s always interesting to see the results, and who knows, you may uncover something we all thought wasn’t there.